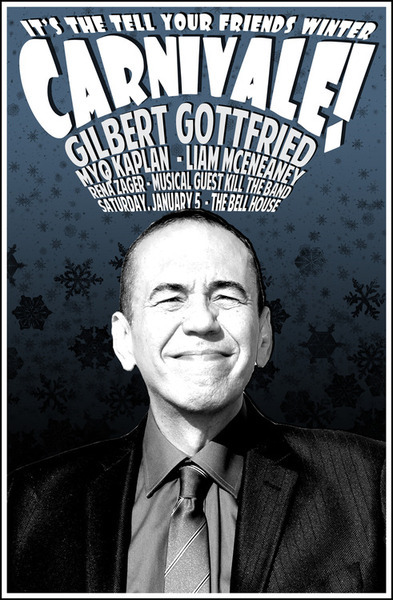 Some of you may remember that comedian Gilbert Gottfried was originally scheduled to play a TYF! show at The Bell House around Halloween 2012, but that show was preempted due to Hurricane Sandy. Well, the good news is that Gottfried along with Liam McEneaney, Myq Kaplan, Reza Zager and musical guests Mike Doughty and Kill The Band are all appearing tonight (Saturday, Jan 5) at The Bell House at TYF!’s Winter Carnivale. Tickets will be available at the door. It’s going to be an audio magazine, featuring the best of NYC’s indie culture, with regular interviews with some of the city’s best comedians, musicians, writers, and so on. In addition, we’re going to have music, readings, and storytelling from some of the city’s best. Upcoming guests include Mike Doughty, W. Kamau Bell, Bryan Tucker, Christian Finnegan, Todd Barry, Baratunde Thurston, A Brief View of the Hudson, Victor Varnado, Catherine Popper, and many many more.